I have had a long career in technology and have had many roles during that career. I started with a support role and moved to development. I was a developer early in my career. Eventually I led a small development team and then became the CIO of a $500 million company. I have always wanted to run a technology company and RexVid allows me to achieve a lifelong dream. RexVid is a highly collaborative mobile app that has many elements of video and group dynamics. We had to consider privacy, security, payment, social media sharing, having efficient code, system performance, etc. It quickly became apparent to me that I needed help and lots of it. I hired Creed Interactive, based in St. Paul, MN, to help develop RexVid. Bringing in a trusted partner like Creed Interactive was one of the best business decisions that I made. At that point it quickly went from I to we and the productivity skyrocketed. 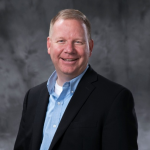 From there we added the Chief Marketing Officer, Andy Eckert and the Chief Operating Officer, Steve Gran. Eventually we partnered with an amazing marketing team in Burnsville, MN, called Diedrich RPM and RexVid started to really move along. It has been a true challenge with countless hours, many sleepless nights and hours of discussion on how to proceed. We reworked the app from the very foundation to make sure it would meet our customer’s needs. I never imagined the challenges we would encounter, but all of the hard work, dedication and enthusiasm from the team has made it all worth it! We truly believe we will change the way people recognize important occasions. We want to turn life moments into memories! A proven visionary and leader that is passionate about creating an exceptional customer experience. Jamie's background uniquely allows him to see all aspects of a business to help drive improvement, reduce waste, create visibility and increase profits while better serving the customer. As technology continues to increase in importance, every company is a technology company. Organizations need a leader that can leverage technology to help all areas improve. NASA has a cool app that provides up to date information on all sorts of interesting and fun things. I am a bit of a space junky and love to watch the International Space Station zip by on a clear night. Their app is amazing and shows the latest tracking statistics, including a visual aid to help determine the exact location of the ISS. The ISS is an incredible technology feat created by many of the best minds from around the world in a highly collaborative project. When I look up on a clear night and track its flight it literally gives me chills. It is inspiring to think of what we can do if we work together using our best skills and resources to collaborate on a common project. In a very small way, RexVid is like the International Space Station. 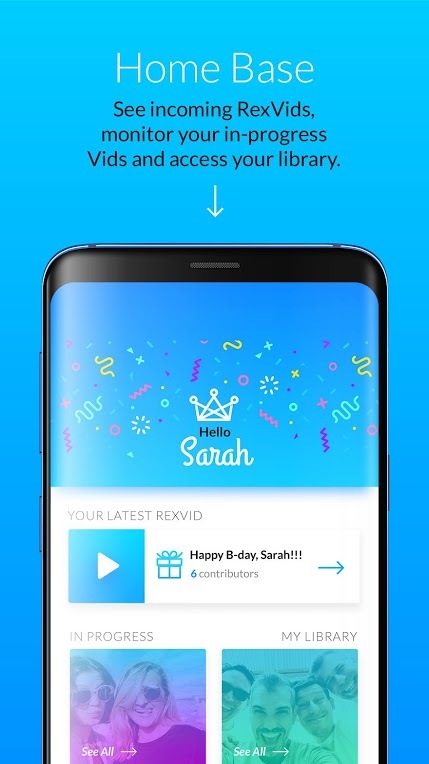 RexVid is an app that allows a user to easily collaborate with family and friends on a project that they have in common! We started working on RexVid in 2017. The company was formed late in 2017, and development was quickly started. It was so exciting to see the first version of RexVid in early 2018. We have come a long way in one year. RexVid has been reworked and improved in countless ways. At first we received input and suggestions from family and friends, then we expanded it to their friends. Once we had a minimal viable product we did consumer research and surveyed people across the country to get a better understanding of what our customers would like in an app. The data was overwhelmingly positive. It put a little more pep in our step and the development cranked up to another level. We continue to add features, make improvements and listen to our customers. The idea is quite simple but complex to develop. We wanted to allow people to stay connected with important people in their lives. RexVid is unique in many ways and introduces a new concept to the market place. 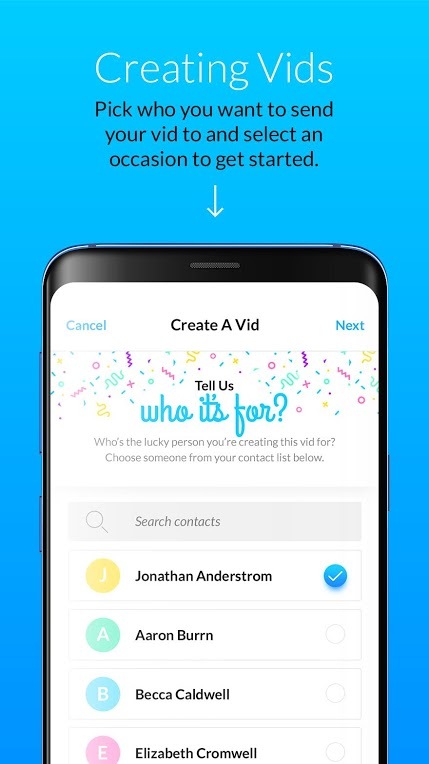 It is very easy to get your family and friends to collaborate using a fun video app! 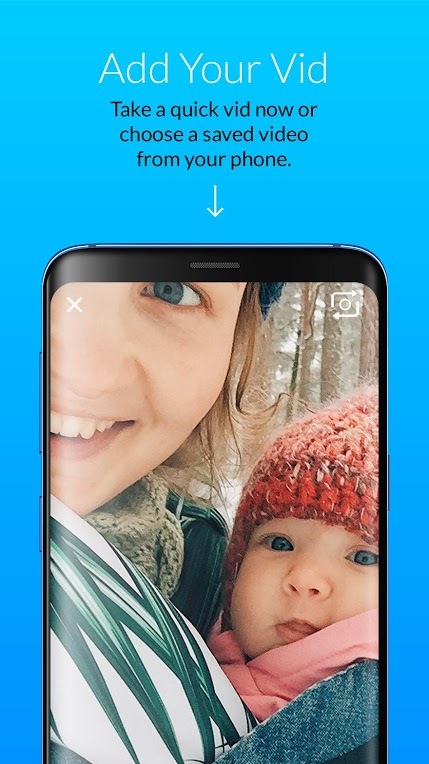 RexVid is the first mobile application that automatically stitches videos together to deliver a seamless, collaborative video with no human intervention. RexVid is still a young application, as it matures it will add a number of cool features and enhancements. Some of them will be delivered in early summer of 2019. We encourage you to check back often as RexVid keeps getting better and better! Please download RexVid from your app store. If you like it, please share it with your family and friends. If you have suggestions, please reach out to jamie@rexvid.com. About App: We can't always be there to tell the people we care about how we feel. But that doesn't mean we don't feel it and want to share it. That's why RexVid is created. 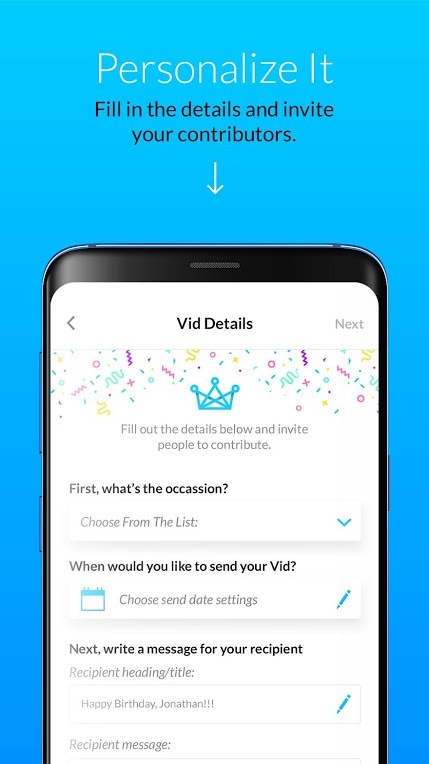 RexVid allows you to invite participants to collaborate and create a video that will then be stitched together and sent to a friend or family member to celebrate any occasion. It's simple to use and an easy way to make that special someone's day even more special. Occasions include: Engagement/Wedding, New Baby, Anniversary, Birthday, Get Well Soon, Work Promotion, Just Because.